The Gazoo Racing Lexus LFA raced in VLN2 at the Nürburgring yesterday, finishing first in the SP8 class and 22nd overall. Kinoshita Takayuki & Wakisaka Juichi were the drivers. 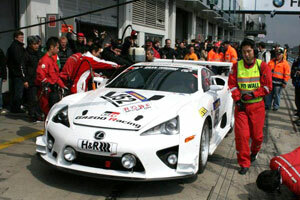 A Lexus IS-F driven in part by GT5 creator Kazunori Yamauchi also raced, placing third in the SP8 class.